Kendall Dunkelberg Thoughts on poetry, teaching, nature, cooking, etc. 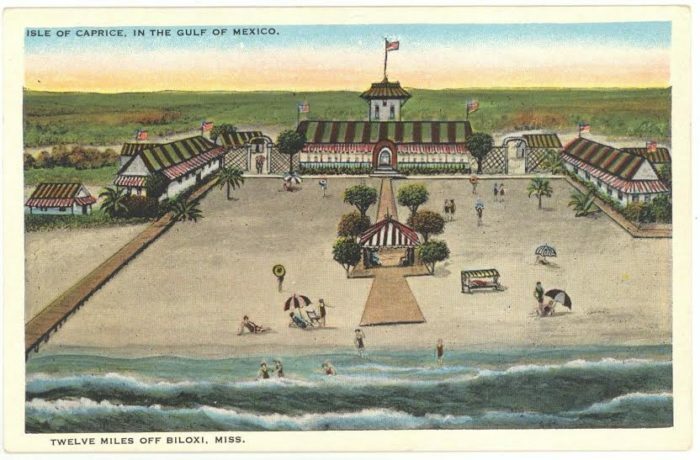 This morning, I ran across an interesting article about the Isle of Caprice, which included this postcard and 5 historic pictures from the island, which was cut in half by a hurricane and eventually washed away entirely. I was glad to hear confirmation of the story I first heard from Christopher Mauer, when he came to The Eudora Welty Writers’ Symposium to talk about Walter Inglis Anderson. That story led to the poem, “Isle of Caprice,” which started my on my journey into the life and art of Walter Anderson. Though I knew of Anderson’s art when I heard the story, the image of the artist drinking fresh water from a pipe rising out of the waves of the gulf inspired me to explore his artistic vision further and led to my book, Barrier Island Suite. The original name of the island was Dog Keys. Walter Anderson speaks of Dog Keys Pass in his logs (I titled another poem after it), and I’d never been able to identify which island or keys it referred to. Now I know that he was referring to the place where Isle of Caprice was located. The article also confirms that name of the island during its heyday as a resort as Isle of Caprice — some have questioned whether it was Isle of Capris or some other spelling. I’m glad to know that detail is historically accurate! The article also confirms what I’d always suspected, that the island was just outside of federal jurisdiction, so it was legal during prohibition to sell alcohol there. Unfortunately, the resort only existed for about 3 years before the Great Depression hit and tourism was dramatically reduced. Should you give your dog buttermilk?